It is often said that selfless service is the fastest way to get rid of past Karmas and attain enlightenment. Some texts describe it as THE only route to salvation. From time to time, many sages highlighted the importance of social and spiritual service. The holy texts have plethora of those examples. Divya Jyoti Jagrati Sansthan (DJJS), under the divine guidance of HIS Holiness Shri Ashutosh Maharaj Ji (Head & Founder – Divya Jyoti Jagrati Sansthan) is making conscious effort to transmit the rich resource of ancient divine knowledge to the masses and guide them in the direction of righteousness through various spiritual events. Again a similar effort was put up in the form of a stall at Hindu Spiritual and Service Fair, Jaipur, Rajasthan. DJJS’s stall (from Jaipur branch) was part of 2nd HSS Fair in Jaipur from Sept 23 to Sept 26, 2016. Sadhvi Arya Bharti Ji from Jaipur branch represented DJJS at the fair. The fair was categorized into six moral values. In all the categories, DJJS showcased their social projects being executed successfully across the globe. Santulan event for Women empowerment and Gender Equality, Sanrakshan for Natural resources management and environment protection, Spiritual Kathas for resurrection of human values, Kamdhenu for indigenous cow breed protection, Youth Workshops as a tool to catalyze true patriotism is a few of the many projects. Sansthan’s literature was available on the stalls along with audio-visual aids. Audience was in awe after listening to the depth of the knowledge, be it on disaster management, jail inmates’ rehabilitation or holistic education. Audience discovered the winning strategy of DJJS, i.e. selfless Seva (Service) in the holy feet of Shri Ashutosh Maharaj Ji as the connecting link. Gurudev not only initiated the project but is acting as the guiding force at every step. 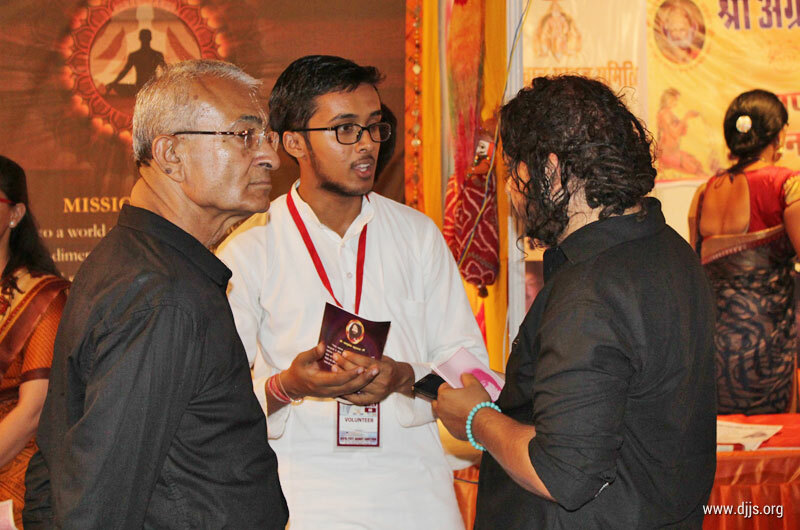 The participants at the stall personified the meaning of true Seva, the one which really help oneself to get rid of past Karmas and lace the future path with master’s love and affection.